People are asking me these days what is "Game of Life" we are occupied with entire summer? The only honest answer I keep giving them is that I don't really know. I guess I lost myself into entire story of our pioneer film making project. It started like any other father-son benign tech play - it was sometime back in the middle of April when I was categorizing our pile of ordinary family video files and our 'cooking series' so in a moment of 'light bulb floating above my head' I asked myself why we don't move one step further and create a little longer short film of some sort. So I asked Viktor and he seemed thrilled about it, especially when I told him that he would play the major role and from there our "Game of Life" project became reality and started growing and morphing into real short movie and after little while began being more and more enjoyable and serious. In short, after four months of all of our 'Hollywood' efforts, Viktor and I proudly present a science fiction short film based on "Game of Life", a cellular automaton game invented by John Horton Conway in 1970. 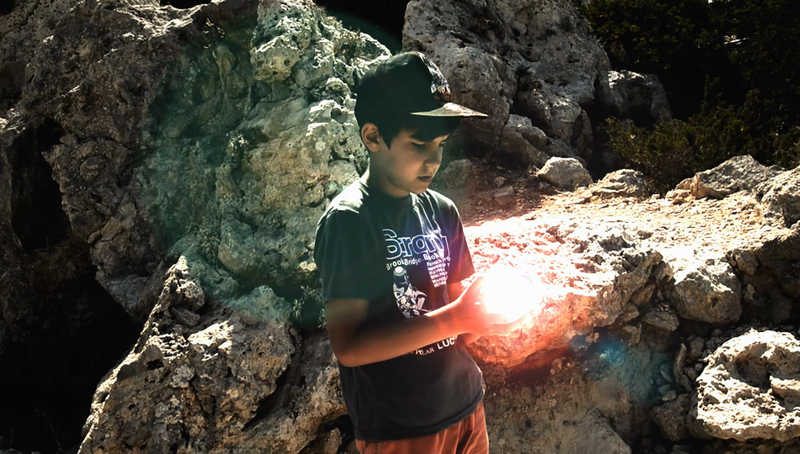 Actually, this is the first episode in potential series we called "Flares and Fireflies". We hope you will enjoy watching at least as much we enjoyed making it and - this is important - please keep in mind that we are not really educated film-makers or talented actors and that this is pretty much maximum what we could do with all of our knowledge and modest technology we used, to say the least. If you like it, after the movie, later in the post, is the story of how and where we made it, entire script, some blooper stories and behind the scenes photos. First of all, I hope you like our film and for further understanding what I would say about the core of its script is that it tells a story about a young boy who's following a glitch in the system, presented in real life as a firefly, through numerous portals to the place where he meets a man with the final orb, the artifact that seems to be a way in for full understanding of the life itself, its origin and the rules it is built on. Just like in Conway's simple two-dimensional game, the life itself could be the same - just a set of rules in some artificial zero-player game that on quantum or molecular level provides results of interactions of main ingredients. That was about "Sci" part of the "Sci-Fi" genre. Fiction that follows the story is in the fact that the life might be fully artificial in origin. In other words, the film explores the rules of evolution that are not intended to be seen or understood by everyone. Even those chosen to dive into game by random case or by complex rules outcome are not able to understand the principles at once. If you are asking now how the game of life really looks from the inside and behind white-green wireframes, well, you will have to wait for another episode. But, is there going to be another episode? The honest answer is that I don't know. I really don't. So far we only have ideas and from there to the final file is a long way. We'll see. 01. Wakeup 1 - Strange sound? Nothing. Going back to sleep. 02. Wakeup 2 - Light appears. Goes through the door. 03. Getting out of bed, following light. 05. At the balcony. Light and mild explosion. Artifact on the table. 06. Examining the artifact. First portal appears. 07. Light goes into abandoned house. 08. Appearing in abandoned country house. 10. Finding light on the forest stone. Goes through second portal. 11. Ending in the sea. Getting out on the beach. Stealing dry clothes. 13. Entering lighthouse site. Following light. 14. No artifacts here. Watching the lighthouse. 15. Seeing multiple flashes on the horizon over the site. 16. Site reappears in white wireframe only. People too. 17. Standing up in wireframe. 18. Checking a man who's reading Kindle. 21. Looking at the Kindle man again. Everything back to normal. 30. Reaching for the backpack. Taking out the final artifact. 32. Taking the artifact. It starts glowing. 33. Going back to beach. 34. Going back to abandoned house. 35. Going back to balcony. 36. Wakeup 3 - Realizing it was a dream. Going back to sleep. 37. Sleeping. Zooming hand. Hand is going wireframe. 38. Back to normal. Light on the hand. 39. Light goes to the clock table. In the end, "Game of Life" is composed out from 50 scenes filmed on four major locations. Two of them are Viktor's room and our living room decorated with green screen for the occasion. 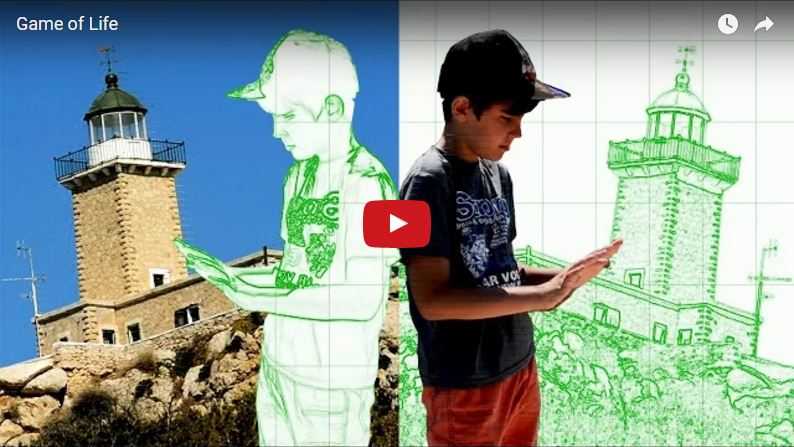 The adventure starts and ends in main character's room and the only dialog is filmed in front of green background and merged with coastal background we took in Greece. Unfortunately, technologically speaking, this is the weakest chain in the movie and not only because of our lack of efforts. "Chroma key" software within Adobe's "After Effects" didn't cope too well with modest laptop I have used to run it through. It failed and crashed too often during rendering and it got out the last nerves out of me. If you add to all the struggles that consumer dSLR (Nikon D5200) we used to film it is not perfect for audio capture without external microphone, and the fact that we had to record audio separately, I have to say that I am not really satisfied with dialog scene but in the end I'd like to think that this is the best I could do with editing that part of the film. However, this film would not be possible without a lighthouse as it plays major role in the story and we found it just 20 kilometers from our hotel during our summer's vacation. It was located some 30 kilometers away from famous Greek city of Corinth built on a rock at the end of a small headland with tremendous view to the entire Corinthian gulf. 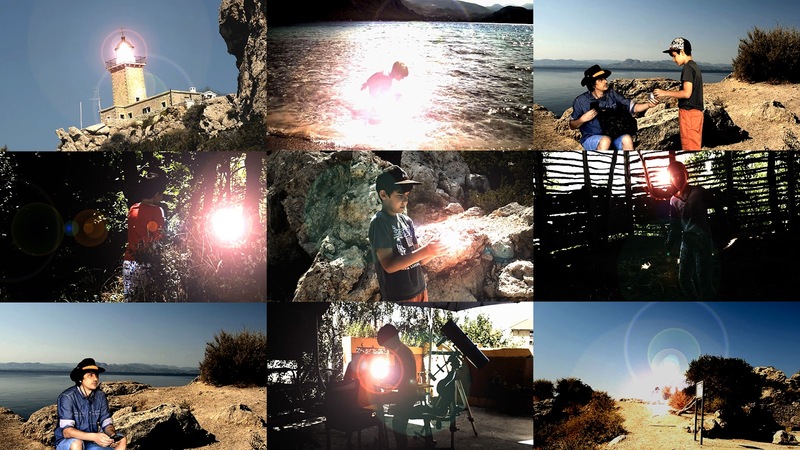 We spent three days on the site and nearby beach and finished all the 'Greek' scenes and enjoyed amazing time on local beaches and restaurants. 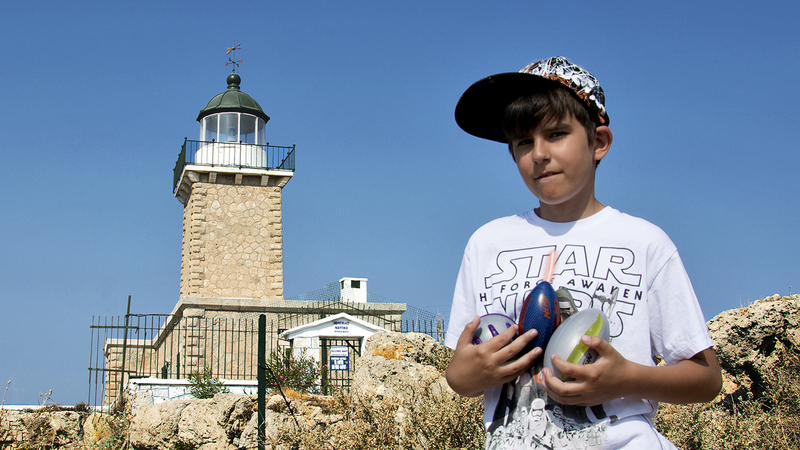 In above photo, Viktor, with our 'nerf' portal stone preps, is posing in front of 'Faros Melagavi' not far away from the 'Vouliagmenis' lake where we filmed last portal scene and also just next to ancient archaeological site of 'Heraion of Perachora' - a sanctuary occupied by real oracle, just like the one in Delphi, dedicated to the goddess Hera and built in 9th century BC by some Corinthian ancient cult. Here, just next to the old ruins of the temple of Hera I found a stone perfect for the background of the green screen dialog scene. Before we went to Greece, I 'scouted' the entire site with Google Maps and photos people took and posted in the Google's gallery and all I have to say is that it looked perfect for filming just like I hoped for. Very little improvisations were needed for 'running' and 'firefly' scenes. The same was with filming 'portal' scene on the beautiful sandy beach of Vouliagmenis lake, which is actually a lagoon connected to the Corinthian gulf and Ionian sea with a narrow strait. 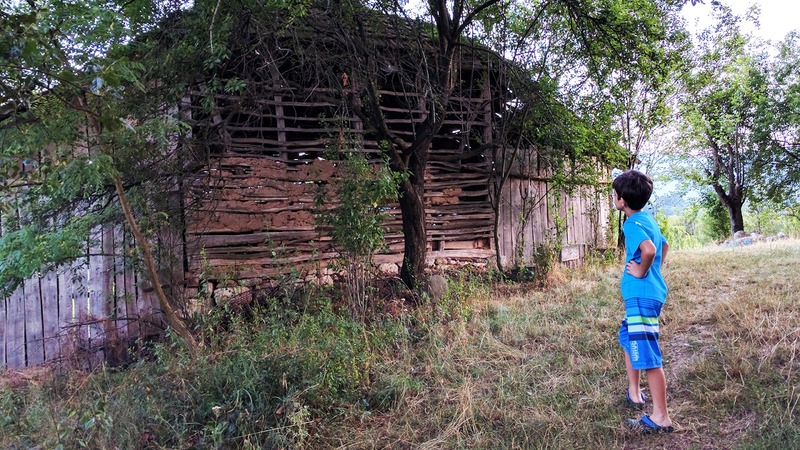 Finally, the fourth location we used to film intermediate portal scenes belongs to our special place - a village in eastern Serbia where we spent many vacations and weekends in the past. The name of the village is Guševac and I mentioned it before on the blog on numerous occasions. With its intact mountain spirit it was our first choice. The very first scene was actually filmed here in the abandoned barn. I intended to use nearby forests for additional scenes for second portal but due to the complexity I gave up of that idea. It would be visually great but it is not really that connected to the main story. Photo below is showing one of our filming location for firefly runaway scene. If you ask me what I liked the most behind and before the scenes of "Game of Life", without a doubt I say it is the entire adventure of making it. 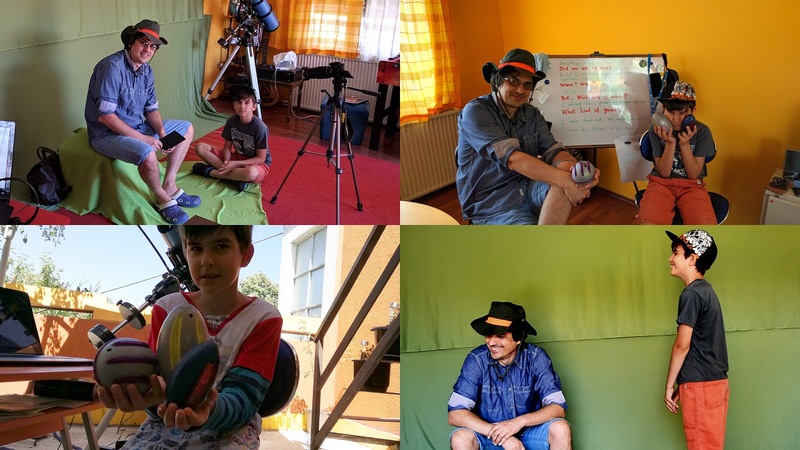 It started as a father-son summer play and in the end, this is what it really is - endless fun of filming scenes, creating script, directing the plot, improvising the story and scenes, enjoying all the bloopers and laughter on all 'sets', especially in Greece. I really can't say what was funnier to do. Even the editing was special time with learning all new stuff and knowledge and in a way I am now looking on movies and TV shows with different eyes and capturing all the perfect and imperfect flow of scenes with my new 'director' habit. Small regret and disappointment was the equipment. I know I am not perfect director and cameraman but I am more than positive that with at least little better technology, including software and rendering computer, the final movie would be much better. At least it would mask or hide most of our imperfection and flaws. One thing is for sure though - if you are thinking of filming your own short movie with modest consumer camera and not so obeying tripod - don't think twice - go for it and however the result is non-ideal in the end, I guarantee you that the feeling will be just perfect.